I wish I had some of these right now! I'm gonna whip some up and even sprinkle some white chocolate in the batter so a couple of cookies have that taste sensation. Thx for sharing! This looks so awesome! I love it! Very great job! I would not trust myself alone with these! Lovely cookies. Love the chunkiness! love these cookies...mmm. Love the macadamia nuts and choc chips added. I can imagine the wonderful taste at every bite. Oooh, these look amazing! I love the idea of maple extract! 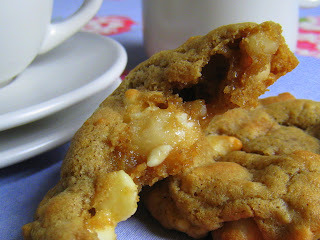 mmm...these cookies look just perfect, I love the combination of almond and macadamia, and of course the chocolate! Wow, I'm salivating, just hope to catch a bite to see for myself. I love nuts in cookies and the addition of chocolate is just one more reason to love these. You have convinced me to try these cookies. The texture is very appealing! You are so right, Mr. P!! These cookies lok so delectable! Thanks all for your comments! I really appreciate them. TC - Let me know how it goes! Tam, Tasty Eats, Cheah, Karine, Jessie, Miranda, Kathy, Ellie, Noelle and Stacy - Thank you each and all! Sanjana - My point exactly. It is ALL about the Dairy Milk. Birmingham's finest! VM - Try 'em out! Canuck - let me know how they work out for you! Kalamari - Took me ages to figure out who you meant! I have now though. And they never told me they had a pecan pie recipe. Sometimes I feel like I don't even know them anymore! My mouth is seriously watering. These cookies look amazing! I'm going to give these a try for the holidays but who knows how many of them will actually make it to any parties. I may devour them at home. What is a Mr. Tom bar? 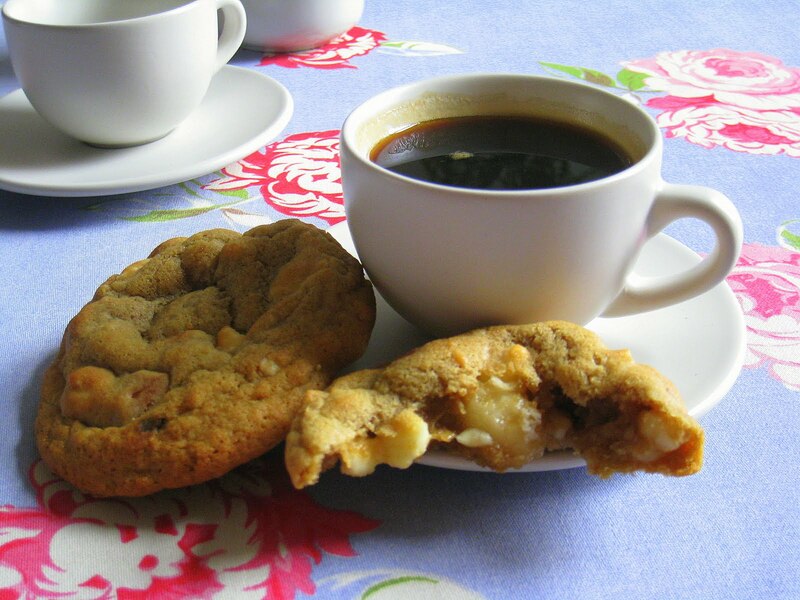 I am not a big fan of nuts in cookies, but yours look delicious...!! Oh damn, oh damn, there goes my diet. Must find macadamia nuts! Your cookies look gorgeous, and that recipe sounds fantastic! I love these cookies so much! I make them with raisins, hazelnuts and cinnamon. They are the most awesome cookies ever! Thanks so much for posting them! Can I just say, how much I adore these cookies? To me (and to my significant other and to my family and to anyone else I ever let have one of these) this is the perfect cookie base - I make them with tons of raisins and hazelnut (my favorite) or cranberries and almonds or with plenty of cocoa, dark chocolate and hazelnuts (so favorite). Absolutely yummy! Thank you so much for sharing! Thanks so much for this recipe! The cookies taste amazing. I've been following your blog for quite a while, and I love it.